As previously mentioned, Tori has been excitedly waiting for school to begin. The first 2 days she got to sleep in until 8 am due to their being no before/after care. She was happy and ready to go both days. she enjoyed her first couple of days and made some new friends (even though she doesn't know their names yet, but knows they like her shoes!). We were expecting her to be the first one who would get in trouble for talking too much, but apparently it was another boy who got that privilege. It sounds like she's been a pretty good student so far. Today she starts before/after care and the first full day of school. She got up in a better mood than most days she went to the sitter's. She wasn't quite sure what to do once she got to before care, but I bet the full day will tire her out tonight. she's been excited to wear a new uniform every day and likes picking out her clothes the night before. So far no homework, but I'm sure it'll pick up next week. 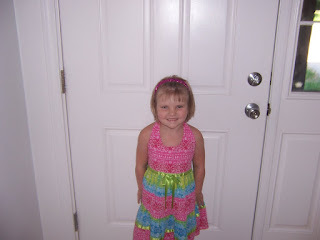 Tonight she also gets her haircut and we are going to the mall to hopefully find her a few more uniform dresses. We thought this would be a bigger transition for her and that we'd be having an unhappy child with lots of battles about school, clothes and getting up in the morning, but so far, she's been pretty good about everything. I think her brother leading the way and her outgoing personality helped ease her fears and allowed her to enjoy the beginning of school. Hopefully it continues.